The scale at which we view our landscape affects the way we describe our landscape. At the small (or broad) scale we tend to make broad generalisations as though we were viewing Victoria from a satellite. While at the large (or specific) scale we are much more particular about describing the variations that we observe. This approach of viewing landform at different scales tends toward using a hierarchical system to describing landscape, particularly landform. A hierarchical system based on scale can be used as a framework to provide a consistent basis for classification that aids description. The relative elevation of landscape features can provide a consistent model for landform description, as this factor will have a major effect on landscape behaviour ie. differing erosional potentials due to gravity (Vis mountains versus plains). The classification defined in the table below, has been used to provide consistency in relating landscape dimensions with general concepts of landform ie. When does a hill become a mountain? This classification system is strictly morphological and indicates the amplitude of the landscape. There has been significant research into landform and related areas of study. These include sites of geomorphic significance in various parts of the state (Rosengren, N., 1981 & 1984) and the study of regolith (see Joyce, E.B., et al 1999). The examples above are important contributions to understanding landform but there are other studies that are also relevant, both academic and government led. The Victorian Geomorphology Reference Group (VGRG) has instigated a review of the geomorphology of Victoria, with further investigation and mapping of designated units still required. See the geomorphology section below. The use of digital elevation models (DEM’s) and remote sensing techniques such as gamma radiation emission detection, or radiometrics, has enabled a greater scrutiny of the landscape with greater reproducibility (see the previous section on elevation for an example of a DEM). Digital elevation models approximate the land surface based on contours, spot heights, or even new satellite and aerial based imagery, radar and laser scanning. This allows the easy manipulation of land surface data. DEM's depending on their source material can be very accurate. However, there are a number of differences compared with the traditional approach of describing landform (qualitative assessment of landform). Much depends on the resolution of the DEM but the flexibility of using digital data means that any classification of the continuum of data can be made. This means that by using digital data it is possible to divide the elevation data into any number of classes, to ascertain any terrain manipulation required (eg. to concentrate on subtle changes at low elevations that could highlight the old stranded beach ridges). It is also possible to derive indices such as slope and slope curvature, which define drainage lines and crests. Birch, W.D. (1994). Volcanoes in Victoria. Royal Society of Victoria. Cochrane, G.W., Quick, G.W. and Spencer-Jones, D. (Eds), (1991). Introducing Victorian Geology. Victorian Division of the Geological Society, Australia. Pg 320. Douglas, J.G. and Ferguson, J.A., Eds. (1976). Geology of Victoria. Spec. Publ. Geol.. Soc. Aust. 5. Douglas, J.G. and Ferguson, J.A., Eds. (1988). 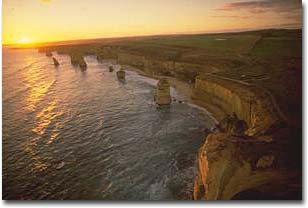 Geology of Victoria. Second Edition. Spec. Publ. Geol. Soc. Aust. 5. Duncan, J.S. Ed. (1982). Atlas of Victoria. Victorian Government Printing Office. Hills E. Sherbon (1975). Physiography of Victoria. An Introduction to Geomorphology. Whitcombe & Tombs Pty Ltd, Australia. Jenkin, J.J. and Rowan, J.N. (1987). ‘Physical Resources’ in Agriculture in Victoria by D.J. Connor & D.F. Smith. Australian Institute of Agricultural Science, Parkville, Vic. Ch 3. Jenkin, J.J. (1988). See ‘Geomorphology’ in Douglas and Ferguson (1988). Second Edition. Geology of Victoria. Joyce, E. B. (1999). ‘A new regolith landform map of the Western Victorian volcanic plains, Victoria, Australia’. In Taylor, G. and Pain, C. (eds), Regolith 1998. Australian Regolith & Mineral Exploration, New Approaches to an Old Continent, Proceedings, 3rd Australian Regolith Conference, Kalgoorlie, 2-4 May 1998, CRC LEME, Perth, pp117-126. McDonald, R.C., Isbell, R.F., Speight, J.G., Walker, J. and Hopkins, M. S. (1990). ‘Australian Soil and Land Survey Field Handbook’. Second Edition. Inkata Press. Melbourne. Rees, D. B. (2000). Ed. Land Systems of Victoria. Edition 3. Technical Report No. 56. Centre for Land Protection Research. Victoria. Rowan, J.N. (1990). Land Systems of Victoria. Department of Conservation & Environment and the Land Conservation Council. Rosengren, N.J., McRae-Williams, M.S. and Kraemers, S.M. (1981). Sites of geological and geomorphological significance in Central Gippsland. Ministry for Conservation, Victoria. E.S.P. No.341. Rosengren, N.J. (1984). Sites of geological and geomorphological significance in the Shire of Otway. Department of Conservation, Forests and Lands. E.S.P. No.399.